Slice the rolls leaving the rear of the roll attached. In a small bowl, whisk together the red wine vinegar and oregano. Slowly whisk in the oil until the mixture is emulsified. 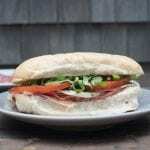 Layer the prosciutto, Capicola, salami and cheese onto the bottom of the roll. Top the sandwich with tomatoes, onions and lettuce. Drizzle with olive oil mixture.